A subpoena is a written directive issued in connection with a civil lawsuit or criminal or agency investigation or proceeding requiring a person thought to have relevant information to appear as a witness to produce documents or other evidence and/or to testify at a pre-trial deposition, a trial or a hearing. Receiving a subpoena can seem ominous and be startling because often it is delivered to your home or place of business by a process server and the document typically includes a warning that compliance is required “under penalty” (which is what “subpoena” means) of contempt for disobedience. However, there are often legal options available either to challenge the subpoena, narrow its scope, provide you with more time to respond or make responding to the subpoena less difficult or burdensome. 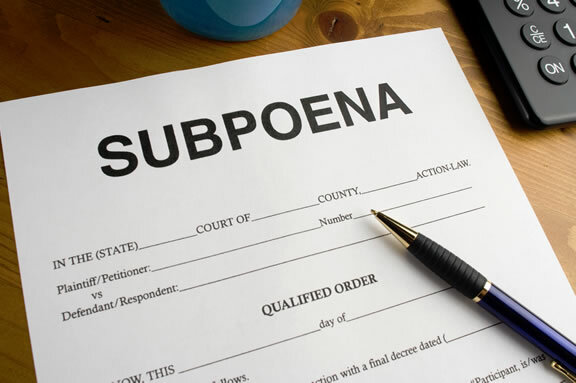 If you or your business has received a subpoena and you want to discuss it with an attorney who is familiar with the subpoena process and experienced in advising clients about the issues involved with responding to, challenging or complying with subpoenas, please contact Larry Sass of the Law Offices of Laurence J. Sass.